Aixtron formed a JV with South Korean firm Iruja a leader in sputtering tools, used for coating materials such as ITO (Indium Tin Oxide), Aluminum, or IGZO (Indium Gallium Zinc Oxide) using a magnetic field to create parts of the OLED stack. The JV will use Iruja’s expertise in material handling and Aixtron will contribute its OVPD technology, with Iruja taking an equity stake (up to 20%) in Apeva over the next few years. Together, the JV will provide a OVPD deposition systems of any size. Currently ‘a major Asian OLED display maker’ (expected to be Samsung Display) is evaluating the technology, using a Gen 1 prototype and a Gen 2 prototype. If qualified, Apeva expects to receive an order for the tool in 2019. Apeva’s technology is an outgrowth of Aixtron’s Showerhead system that is used in its MOCVD tools. 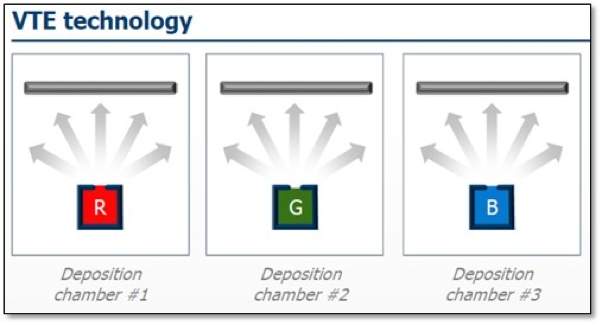 In a typical VTE deposition system, a material source is heated until the material evaporates, at which point it rises in a vacuum and condenses on the cooler substrate surface. The vacuum allows the material’s atoms to travel in a straight line, but as the source material evaporates, it not only coats the substrate, but the cooler walls of the chamber itself, which wastes significant OLED material. The material utilization is low, anywhere between 25% and 40% (without the FMM), and as the substrate size increases, the source must be moved further from the substrate to coat the entire sheet, causing non-uniformity and lower material utilization. A separate chamber is needed for each OLED material in most cases. Apeva’s technology, which was licensed from Universal Display,mixes a number of the materials before they reach the deposition chamber. Once the material is mixed and evaporated in a hot inert gas, it flows toward the substrate. In this process, the wall of the reactor is heated to reduce condensation. As the OLED materials are mixed outside of the chamber (as opposed to VTE where the source is essentially in the chamber) the movement of material can be controlled by regulating the flow of the carrier gas, which allows for more uniform coating. The material and the carrier gas are released directly above the substrate through a ‘showerhead’ that is close to the substrate, which also reduces material waste, giving the system a higher efficiency than typical VTE deposition systems. The Apeva tool is not the same as the newly developed prototype from Universal Display called Organic Vapor Jet Printing (OVJP), which functions like a slot printer and is designed to use powder based OLED material to manufacture OLED displays using side by side RGB without using a FMM. The prototype is being used to test the feasibility of the tool and to prepare for eventually adoption by a toolmaker that can market, sell and service the tool in the field. Apeva’s tool has been around for some time and was first installed by RiTdisplay, but never used. They claim that the recent improvements of the OLPD equipment make it suitable for large area deposition and they are competing to get the equipment used to deposit the organic layers for the blue emitter used in Samsung’s hybrid TV pilot line that we reported on last week.